This is so cool, I just had to share! 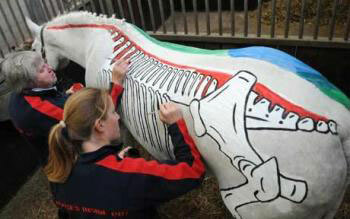 Would you like to learn more about how your horse works? 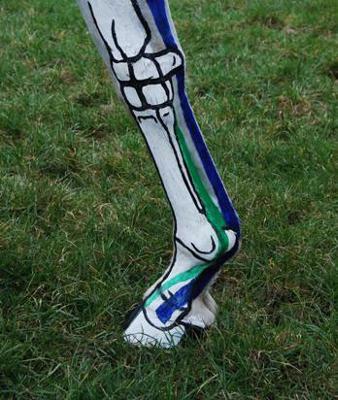 This novel concept created by Gillian Higgins, a Sports and Remedial Therapist, Equine Physiotherapist, Rider and BHSII SM, gives a fascinating insight into how the horse works, from the inside out. 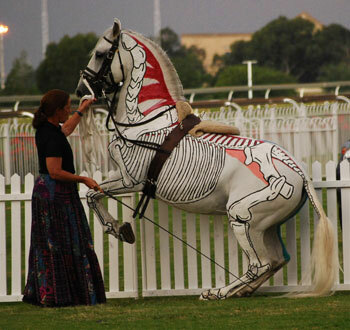 Gillian paints the skeleton and musculature on the side of horses to bring the subject to life. She is based in the UK and runs regular clinics and she also has a DVD and books if you are unable to see her Horses Inside Out clinics in person. Join in and write your own page! It's easy to do. How? Simply click here to return to New topics.